It’s only natural that children want to be held close to their parents. It’s an instinct we all have from birth, which is shown in the forms of hugs and cuddles. Unfortunately, as much as we would love to cuddle our baby all day, we need to have our hands free at times. So it’s common for parents to look for a solution to hold their baby close when carrying out their day to day tasks. The answer to this problem is a baby carrier. These carriers allow you to go about your normal day while taking your baby with you, making sure they are comfortable, safe and secure. Every year, there are new releases into this market which are packed with features that are specially designed to provide you and your baby with the maximum benefits possible. However, with so many products to choose from, it can be difficult to be sure which baby carrier is right for you. Which provides the most comfort? Which one offers the most support? Which is best for your personal situation? To help you answer these questions, I’ll explore my favorite baby carriers that are currently available, as well as the ins and outs of each. If you're not sure what you’re looking for when it comes to finding the ideal baby carrier, my fully-comprehensive buying guide will give you all the information you need to make the most well-informed purchasing decision for you and your little one. Are you ready to carry your baby comfortably, while being productive? Let's take a look at my favorite baby carriers that you and your child will love. To begin my list, I’ve chosen a great all-rounded baby carrier that provides both you and your baby with a great carrying experience. The adjustable straps around the waistline and shoulders provide a secure connection between you and your baby. 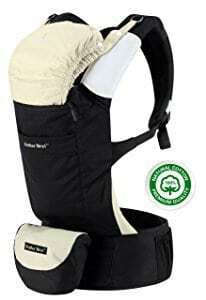 This award-winning carrier is easy to use and can be easily adjusted as your baby grows. With the ability to face your child both forwards and backwards, they can enjoy visually stimulating views of the world around them; comfortably sleep against your body, or breastfeed. Made from 100% high-quality cotton, you can keep your carrier clean and hygienic by machine washing it. What's Great About It: As the name suggests, there are many custom positions you can set with this premium carrier. 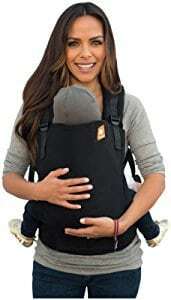 You can wear the carrier on your front, your back, and around your hips, making sure that both you and your baby are properly supported and comfortable at all times. 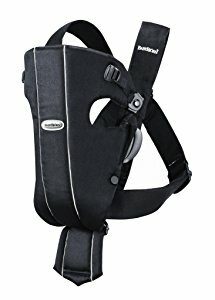 One of the leading names in the baby product industry, BabyBjorn has pulled out all the stops for this carrier. Made using the softest cotton materials, your baby can enjoy complete comfort when securely fastened to your body, ensuring you’re both close and in essential contact. This carrier is ready for use straight out of the box, and can be used for newborns using special inserts. The carrier is designed to be as easy to use as possible, with easy to set straps, saving you time and hassle when trying to secure your baby. The carrier provides support to all the essential areas of your baby’s body, while allowing them the ability to move their arms and legs, which is vital for healthy development. You can face your child towards you or away from you without compromising the support due to the specially implemented head support. What's Great About It: The leading feature of this fantastic carrier is its size and weight. Designed to be as lightweight as possible, this allows you to easily remove and put on the carrier without disturbing your child. If you don’t want to wake your baby when you arrive at your destination, the special clips allow you to detach the front of the carrier, so you can easily put your baby to bed. If you’re looking for a more affordable carrier which provides fantastic levels of comfort and support, the Infantino Cuddle Up Carrier could be ideal for you. This mid-range carrier gives you the ability to carry your child in complete comfort, whether they’re awake, resting or asleep. Depending on your day’s activities, you can choose between mounting the carrier on your front or back. At the top of the carrier, you’ll find a specially designed hood. This lets you to block potentially harmful UV sun rays when you are outside with your baby. The waist and shoulder straps are easy to secure and adjust, making your experience with this carrier even more enjoyable. What's Great About It: Suitable for carrying babies of varying weights, this carrier boasts the classic design that creates the ‘M’ shape with your child’s body. This means that your child’s arms and legs are kept separately, wide enough to remain comfortable, with enough room to move their arms and legs. If you’re in need of a hands-free solution that enables you to carry your baby as you complete your day to day tasks, the Mo+M Baby Carrier has you covered. Made using the finest 100% cotton materials, your child can enjoy optimal levels of comfort. This carrier can easily be folded up and placed in your diaper bag, allowing you to take it with you wherever you go. The structure of the carrier includes a soft fabric hood that protects your child’s skin from the sun. There’s also a zip-operated window, allowing for extra ventilation if required. 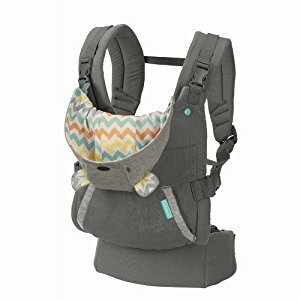 The adjustable shoulder and waist straps let you securely fasten and tighten the carrier to your body while evenly distributing your child’s weight, making sure that you’re comfortable. What's Great About It: The adjustable settings mean that all members of the family can get involved, perfect for days out. The positioning within the carrier is especially good for developing your child’s motor skills and stimulating their brains. If you’re in need of a fully flexible baby carrier that enables you to discover the perfect carrying position for you and your little one, the SIX-Position Baby Carrier has it all. No special equipment or inserts are needed for this carrier, and this award-winning product contains a selection of features that give you the most comfortable carrying experience possible. To accommodate the needs of your continuously growing baby, all straps and fasteners are easily adjustable, allowing you to comfortably and securely fasten your baby in place. With six supportive positions to choose from, you can find the one that makes your baby as comfortable as possible. There’s no extra purchase needed for newborn children, allowing you to use the carrier straight out of the box. What's Great About It: SIX-Position has really pulled out all the stops when it comes to comfort. Included with your carrier is a detachable hood to protect your child from harmful sun rays, and the vast collection of padding and zips allow you to control the air flow to your baby, which is perfect to maintain their temperature. The life of a parent is a busy one. There is always something that needs to be done, so with this in mind, the Baby Tula Baby Carrier has been specially designed to be as easy to use as possible. Suitable from birth until the age of 4 years, this award-winning carrier is designed to be as simple and functional as possible, without compromising on comfort or quality. The carrier can be securely fastened to either the front or back of your body using the high-quality Duraflex buckles, securely attaching you and your baby together. Your baby can also be safely secured using the three-point harness system which creates the classic ‘M’ shape with your baby’s body, ideal for creating enough room for your baby’s limb to move freely. Included you’ll find a detachable hood, which can be used for extra support as well as protection from the sun. What's Great About It: Baby Tula is a renowned member of the Baby Carrier Industry Alliance, an organizational body that’s committed to delivering quality, comfort, and support to you and your baby. This means you can be safe in the knowledge that this carrier has been meticulously tested and has exceeded the standards of the Alliance. If you’re looking for a fully-functional and customizable baby carrier on a budget, Mother Next could have the carrier for you. Produced from the highest quality cotton fabrics, this carrier prides itself on wide padding through the body of the product, particularly the waist and shoulder belts, helping to distribute the weight of your baby evenly, maximizing comfort for you and your child. This carrier can be positioned on the back and the front of either parent and contains several conveniently placed pockets throughout the product, so you can safely store toys, keys and any other vital accessories. The top of the carrier contains a removable hood to protect your child from the sun, so you can take them with you wherever you go. What's Great About It: All fabrics used to create this affordable baby carrier have been rigorously tested to ensure that they comply with SGS as well as American and European safety standards, ensuring that the quality of your baby carrier is the highest it can be. Suitable for children from birth up to the age of 2, the Boba Baby Carrier makes an ideal lightweight carrier that you can take with you wherever you go, freeing up your hands to complete the tasks you need to. Made from the softest 100% cotton fabrics, you can be sure your baby is comfortable and supported at all times. 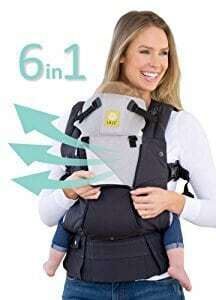 This beautiful carrier can be used on your back or front, while the adjustable straps allow you to evenly distribute the weight of your child comfortably. This carrier set contains a detachable hood, ideal for blocking out sun rays, and foot straps, so your baby’s feet are protected while you’re out and about. Packed with high-quality accessories, including YKK zips and Duraflex buckles, this baby carrier provides consistent levels of quality at all times. What's Great About It: It’s easy to see that Boba has invested a lot of time into making this carrier as simple and effective as possible. Throughout the carrier, you’ll find non-intrusive pockets, allowing you to securely store anything you need for your day out, such as keys, phones and toys. There’s also a bag strap that means you can connect extra carry bags. With so many carriers and features to choose from, it can be difficult to know whether you’re making the best decision for you and your baby. Follow my step by step buying guide below to get all the information you need to find that perfect baby carrier. The support of your baby’s body when in the baby carrier is extremely important. If you purchase a carrier that’s unsuitable for your baby, there’s the potential that your baby could be subject to certain levels of stress or tension, especially around the head, neck and back areas. If subject to this stress for prolonged periods of time throughout the day, this could damage your baby’s natural development. As your baby grows, there are a variety of positions that have proven to be ideal for their growth whilst in a carrier. For example, it’s recommended that babies in their first couple of months adopt the ‘C’ position when being carried. This is usually achieved using a special insert that creates a gentle curve on your baby’s back, reducing pressure on their hips and spine. As your children grow, you can adopt the ‘M’ position or frog-legged position. When searching for your ideal baby carrier, note how developed your baby is and which position would be suitable for their growth. Safety is by far the most important aspect of a baby carrier to consider. When looking at the safety of a baby carrier, look at the quality of the straps and harnesses. Check for the quality of the stitching, the quality of the buckles and the versatility of the zips. As with all kinds of products, the cheaper the product, the cheaper the materials and the build will be. It would be devastating to be in a situation where you are dealing with a baby carrier that has fallen apart, especially if your baby was in the carrier at the time. To help you make the best decision, look for an award-winning baby carrier that has been rigorously tested for safety and passed with flying colors. In addition to this, look for carriers that have been tested and have passed leading safety tests. Both American and European safety standards are good base standards to make a purchase on, but if you’re looking for something completely reliable, looking for a carrier that has been tested by the SGS. Trying to handle a baby and the tasks you’re attempting to complete can be difficult at the best of times. When looking for the ideal baby carrier, you’re going to want one that’s easy to use and will allow you to attach and detach your baby quickly, ideally in less than a minute. If you’re shopping at a local store, try the carriers on before buying one, testing how easily the buckles and straps are accessible to your hands. This will allow you to make quick adjustments to ensure that you’re comfortable and your baby and belongings are secure. Similar to the ergonomics of your carrier, you’ll want to make sure your baby is comfortable for the duration that they are in the carrier. Consider the tasks you are carrying out and whether you will be breastfeeding your baby directly from the carrier. To ensure your baby is experiencing optimal comfort, choose a baby carrier that has multiple position settings. This will allow you to quickly and easily position your baby depending on what they are doing. The most common, and most comfortable carriers are made from high-quality cotton. This allows the carriers to be both durable and comfortable. Trending in Baby Carrying: What are the Best Baby Ring Slings? The weather and temperature can have an adverse effect on your baby. Wrapped up in a material carrier can cause your baby to heat up quickly, especially on hot summer days, which is why it’s important to consider what ventilation features your potential carrier has. Some carriers are designed to be open around the limb and body areas. This provides a natural flow of air around your baby; however, this can feel loose and won’t hold your baby close to you. 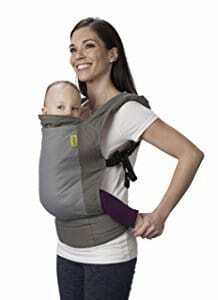 Alternatively, you can choose a baby carrier that is both relatively tight and holds your baby close to you. In these carriers, ventilation is achieved using a selection of zips and buckles that allow you to open the carrier to allow the air in whenever and wherever you need to. More in Baby Carriers: What are the Best Hiking Baby Carriers? There is a vast selection of accessories that are available for baby carriers. Obviously, most parts of the baby carriers are not universal and will be depend on what brand of carrier you choose. In some cases, newborns will require a special insert that is bought separately to give them the support they need. If you don’t want inserts, look for a more high-end carrier that has everything you need straight out of the box. Other important features to look for can include foot straps, designed to hold your baby’s feet to protect them while walking around, as well as fixed or detachable hoods that help to protect your baby from potentially harmful UV rays and other weather-based conditions, including rain and wind. Baby carriers have been around for a long time, but it’s only recently that they have been designed to house so many features and benefits for you and your baby. 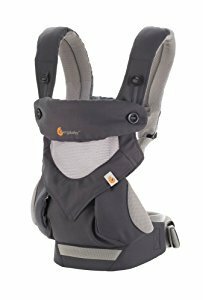 Using the step by step buying guide, look at everything you need in your ideal baby carrier, as this will help you make the best decision, resulting in a happy baby and happy parents.